My rating: 5 stars - Favorite! In 1925 in the Ozark Mountains, LillieBeth Hazkit has learned to love where she can, not turn away from those in need, and stand up for herself when she has to. Feeling compelled to obey God’s word and apply what she knows; she stands steadfast and unmoving upon biblical principles. Collecting strays, runaways, and lost souls has become an accidental habit. Human nature no longer surprises LillieBeth. Protecting her friends from evil men may require using her guns She fights back with every means she has available when moonshiners, racists, and horse thieves invade her life. LillieBeth has always been a powerhouse of morals, believing in and following the teachings of her bible and her church. Although poor monetarily in a small town in the early twentieth century Ozark Mountains, she has never lacked for love, the closeness of her community and the opportunities to right wrongs and make lasting impressions. When her father’s health requires her family to move to the dry air of Arizona, LillieBeth stays behind on the land that was left to her by one of her best friends. Still a teen, she has experienced the good, the bad and the ugly of humanity and she suffers no fools. When injustice and abuse rear their ugly heads, LillieBeth becomes the “landlord” for two young women from completely opposite ends of the economic and race spectrums. Has she bitten off more than she can chew? Why doesn’t her example of living the words of the bible rub off on these two very stubborn women? Meanwhile, someone has stolen some of her horses and she means to have justice served. Oh, and moonshiners have set up business on her property, how does she handle that? One freckle-face girl against men who do not fear the law, then again, this is LillieBeth we are talking about! Going back to LillieBeth’s world felt like getting a warm hug from a friend one admires. Her ways are simple on the outside, but she is a river that runs deep, and example of all the best humanity has to offer, but eve LillieBeth has her moments of confusion as an assumption she made logically years ago isn’t as cut and dry as she thought! Alan Black has led us through LillieBeth’s childhood and brings us to the threshold of her womanhood with touches of humor, danger and the charm of both the mountains and its people. The Inconvenient Stone is touchingly sweet, a little prickly at times, but always an engaging read as his words flow across pages that disappear as we fall deeper and deeper into his tale. He never fails to amaze me with his versatility as a writer and his willingness to give every word he writes, his utmost consideration. Looking for a series that will warm your heart with its simple settings and a heroine with the tenacity of a badger? Try The Ozark Mountain Series, a step back in time and circumstance! 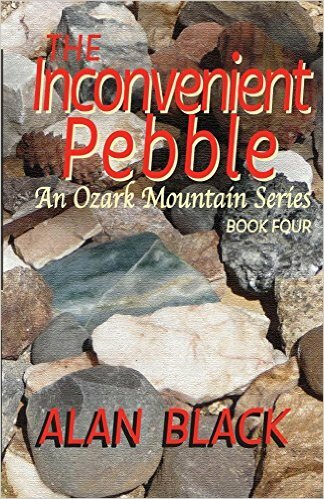 I received this copy of The Inconvenient Pebble from Alan Black in exchange for my honest review.